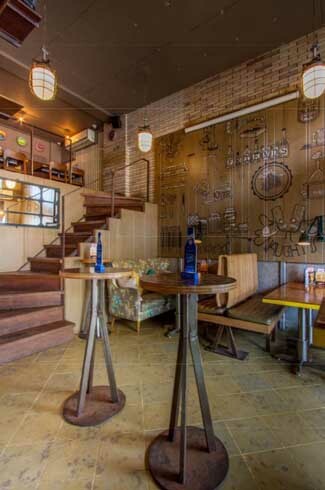 Mumbai-based Vipasna Designs and Contracts (VD&C) firm’s projects are distinguished by their homely charm. VD&C likes to talk about “transformations” of spaces, as opposed to just building of projects, while talking about its work. Founded in 1999 and operating in the spheres of architecture, interior design, and planning, the team prefers to direct all its focus on providing holistic solutions to client requirements. While working on specific briefs, the team, led by Vivek and Upasana Popli, never lose sight of the macro aspects of the project, i.e. how every building can ultimately kick-start the metamorphosis of a street or a locality or perhaps move from a conservative lifestyle that is more liberal and globally-relevant. 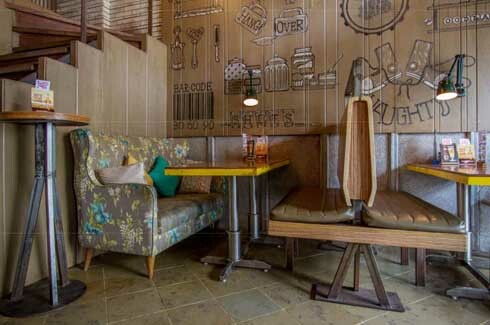 For anyone who thought that the cluttered culinary landscape of Mumbai needed a New York’s West Village type infusion of style, with a cosy heart to boot, look no further than Open House located at Shivaji Park. 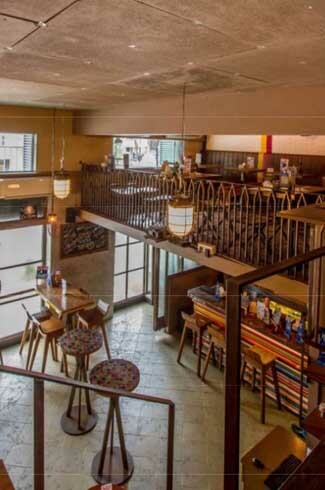 Right from the façade, the focus here is to present to diners a café and bar that feels like home. Study table lights; sofas that could comfortably belong in an English home; somewhat impetuous splattering of colours; and a mixed bag of seating options do indeed conjure up a homely charm. 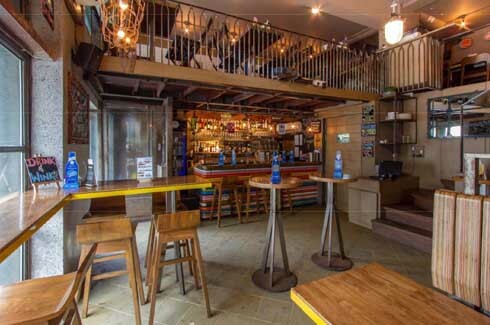 Then there is the bar, with its shock of a bright, candy-coloured table. This combination of disparate elements is what makes the design scheme here so special. There is something endearingly chaotic about the prospect of guests standing and guzzling drinks at some of the tables, even as convivial groups huddle by the bench seats and share meals quietly. However, if this mix isn’t your style, then head to the comfort of the relative uniformity of the mezzanine floor dining area. This section overlooks Cadell Road and is bathed in the sublime hue of polished wood. On one side of the elongated space is an upholstered wall; while on the other is a railing that looks down to the lower dining area. Privacy options are a many at this café. “Homes are extensions of people who inhabit them. This has been our dictum for every residence we do,” says Popli. 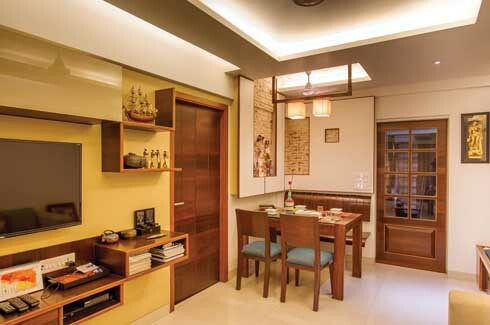 This particular home in Mumbai seems to have been fashioned out of warm light. 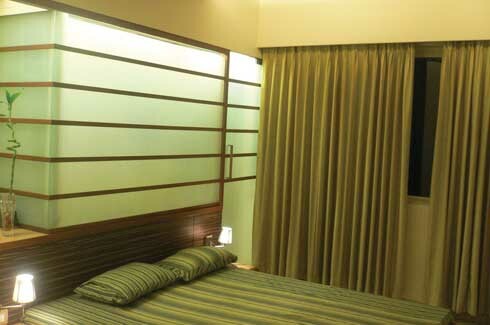 The dominant colour combination of white and polished wood here is enhanced by the lamps and the hidden illumination streaming from under the false ceiling. But apart from the aesthetic restraint of the design, space allocation is the key winner here. By dedicating specific wall accents and textures and spotlights, to different segments of the home, the design team has smartly overcome any space constraints. In the living room, for example, the sweeping smooth white floor adds to the effect of a space larger than what it must calculate to on paper. And the team was also not shy of bringing in slightly surprising breaks from the dominant tenor, as is evidenced by the lightly whitewashed peeps of brick wall that accent the dining area. Even in the rest of the rooms, low-seating, multiple-slotted storage spaces mounted on the walls, and minor departures in wall textures mark out specific corners. This is an effective trick in any Mumbai residential project. The predilection towards colour, detail, and unabashed ‘kitschyness’ of fashion designer Manish Arora has evaded a strict definition for the entirety of his stellar career. So it is a definite challenge to design a store, stall, or any sort of exhibition space for his ‘Fish Fry’ creations. But the Vipasna team is an experienced hand at collaborating with the designer. 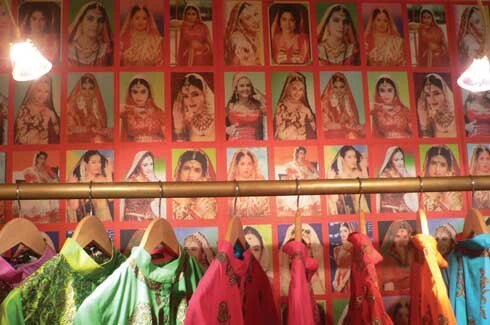 The stores and fashion week stalls designed by the firm are chock-full of brand Arora – covered in deep shades of red, maroon and fuchsia; explosions of prints covering the walls; and montages of beautiful women decked in the blinding bling of Indian bridal finery. “The creative genius of the man translated to wall finishes in his stores and extended to the changing rooms too. 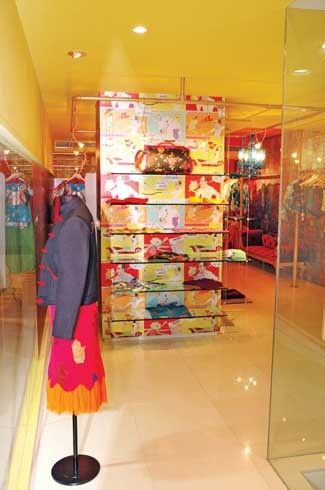 Translating all his techniques for clothes to the interiors was achieved by a close collaborative between the fashion designer and us,” explains Popli.